This version of the set is currently sold out. As of this writing there is one set left in my Etsy Shop at etsy.com/shop/kidneyjewelry. I still have a few sets left with the Golden Kidney in another listing. More stock of both sets will be available again by early April. I am pleased to share my latest kidney creation with you! 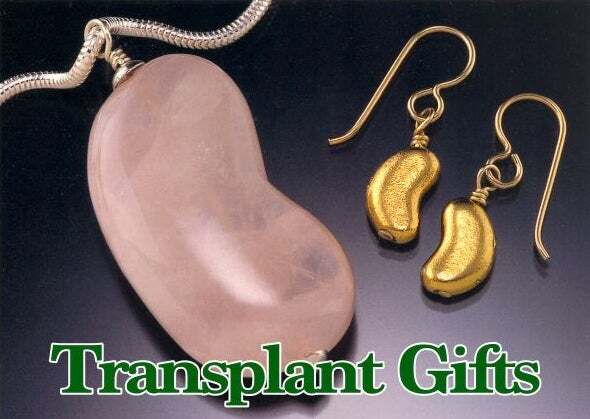 Each 1" long pendant is shaped like a kidney, but also forms half of a butterfly, symbolizing transformation, a perfect symbol for transplants as well. The half with a kidney "removed," goes to the living donor/or a donor family member. The other half, with an "addition" of a kidney, goes to the recipient. The packaging is designed for both transplant participants to open together. These come on 18" chains, but If you would like two different lengths, message me on your payment. I sometimes have 16" and 20" available, and will include those if they are in stock. 20" chains or longer cost a bit more. Small sterling Key Rings are available at the same price for either or both of the pendants. Message me to let me know how you would like the order made. I designed the set and have them cast in sterling silver by a production studio in Bali, Indonesia. The process to create these sets began with my simple concept drawing, then a detailed scale drawing. Next is carving wax models and then casting using the ancient lost wax method, and finally on to the many finishing details. Waxes can break and must be re-made. Unforeseen casting issues can arise. The process took 5 months and many phone calls & emails to get the details just right. The set will be shipped to you in a single box with the pendants carded together, as shown in one of the photos. Each pendant has a sterling chain and a small kidney colored tulle bag for storage. Store in the airtight zip bag provided to prevent sterling from tarnishing. Pendants are 1" long from top of the bail to the bottom. The backsides are flat should you want to have your local jeweler engrave a date, or possibly the word HERO on one of them! International orders are priced for First Class shipping. If you need it faster and prefer Priority International, message me with email and your country's postal code and I will send you a separate paypal invoice with your order and the correct shipping. Priority generally runs between $33.00-38.00 USD.